The versatility of the guitar is simply incredible. Almost any genre of music can be created and played on either an electric or acoustic guitar. As well as being flexible in musical styles it is also adaptable in tuning allowing the guitar to change each string to any required pitch. 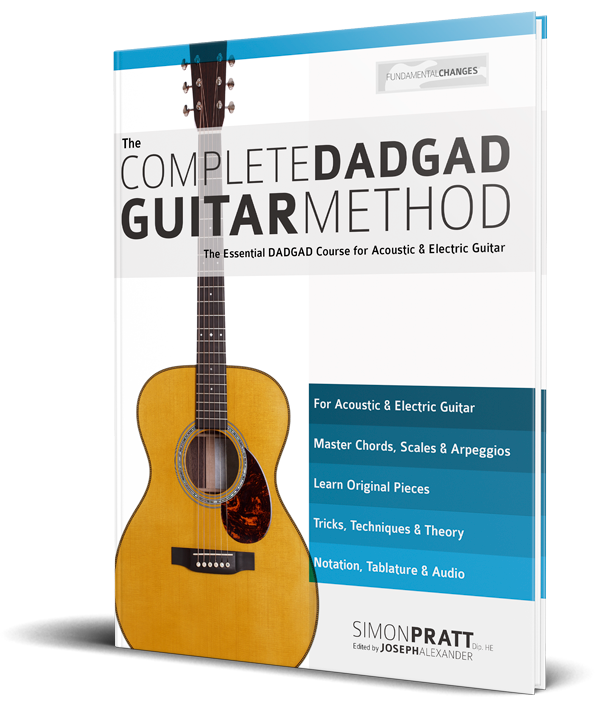 Although standard tuning (E A D G B E) is the most common tuning, in this lesson we will explore how to tune to DADGAD. DADGAD tuning makes the guitar sound like a completely different instrument. Although we have only changed three strings from standard tuning, the difference is enormous. In DADGAD tuning the 5th, 4th, and 3rd strings are identical to standard tuning E A D G B E, so require no alteration to them. The 6th, 2nd, and 1st strings are all a tone (two frets) lower than standard tuning, so need to be lowered and accurately pitched using a tuner. If you don’t have a tuner to hand, tune your 6th and 1st strings to be the same note (in different octaves) as the 4th string ‘D’, and the 2nd string to be the same as the 5th string ‘A’ an octave apart. For a quick video reference for tuning to make sure you watch the YouTube video at the top of the page. Example 1 gives you the tuning notes in order from the 6th (thickest) to the 1st (thinnest) string. As a safety measure and a quick way to check you are in tune, you can use adjacent strings to check that they all match up. Example B demonstrates how to do this in DADGAD tuning. Natural harmonics are a useful tool to use for tuning . Example 3 is how I tune up using natural harmonics in DADGAD. Watch in awe as Andy Mckee plays his YouTube smash hit Drifting.